Monday was a holiday, so I worked on updating our plan for the previous year, and beginning to plan for the coming year. We were in Nampula to hold a planning workshop with our entire staff, and assist with a changeover in leadership in the field. On Tuesday, we arranged to go out to the field to visit on of the communities where we have been working over the last year. It was great to finally see the results of our hard work. We arrived unannounced and walked up to the water point and there were several women there pumping water to fill their containers. Soon after our arrival, of course, there were a lot more people and a lot of little kids laughing and smiling. We also visited a few latrines that families have constructed. At the first one, we had to wait because it was occupied. That was a great sign that the latrines are actually being used. The field trip reminded me of why I am working in this sector. It is always good to have that reminder every once in a while. 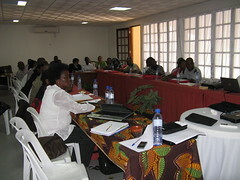 Our planning workshop was held on Thursday and Friday. Our whole staff was there. We reviewed our progress over the year. 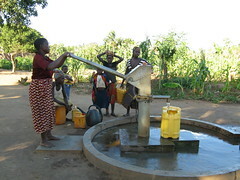 So far we have constructed about 140 water points. 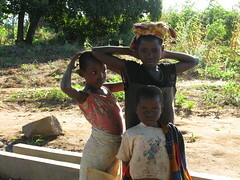 We also promote sanitation and hygiene in the communities and as a result almost 4,000 latrines have been constructed. Of course, the challenge is now for the communities to maintain the water points and continue to use their latrines and to practice improve hygiene. Then we spent a day planning for the coming year. 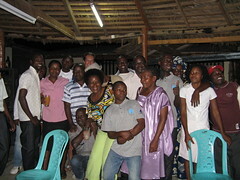 On Friday we had a party for our staff. It was a lot of fun and allowed everyone to relax and enjoy themselves after working so hard all the time. I was led out onto the dance floor to try to imitate the Mozambican style of dancing several times throughout the evening. Saturday we flew back to Maputo and met up with another colleague who had been there working all week. And that was my trip to Nampula; I’m sure I will be back there again in future, but only time will tell when. Submitted by RonaldRef (not verified) on Wed, 2018-02-21 23:21.